Made by Ah Xian in Jingdezhen, Jiangxi, China, 1999. A porcelain cast of a Chinese woman's head and shoulders, decorated with a phoenix and peony scroll design in low-relief and finished with a soft blue glaze. The woman's eyes and lips are closed and her hair is drawn into a twisted bun. The unglazed base is marked with black paint, and features the inscription, 'China, China - Bust 39'. Four Chinese characters are impressed into the base. The base is inscribed 'China China - Bust 39' and is impressed with Chinese characters that translate to 'fineware made by Ah Xian'. Chinese-Australian artist, Ah Xian (born LIU Jixian, Beijing, 1960), designed this porcelain body-cast in 1999 for his 'China, China' series. Made in Jingdezhen, Jiangzi province, it is cast from a local girl whom he met while developing the series. Ah Xian began these works by making plaster-of-Paris body casts to create moulds into which he then pressed sheets of porcelain clay. He employed local artisans to apply the glazes and decorations in traditional Jingdezhen styles. This piece features a phoenix and peony design, carved in low-relief and finished with a yingqing (shadowy blue) glaze. 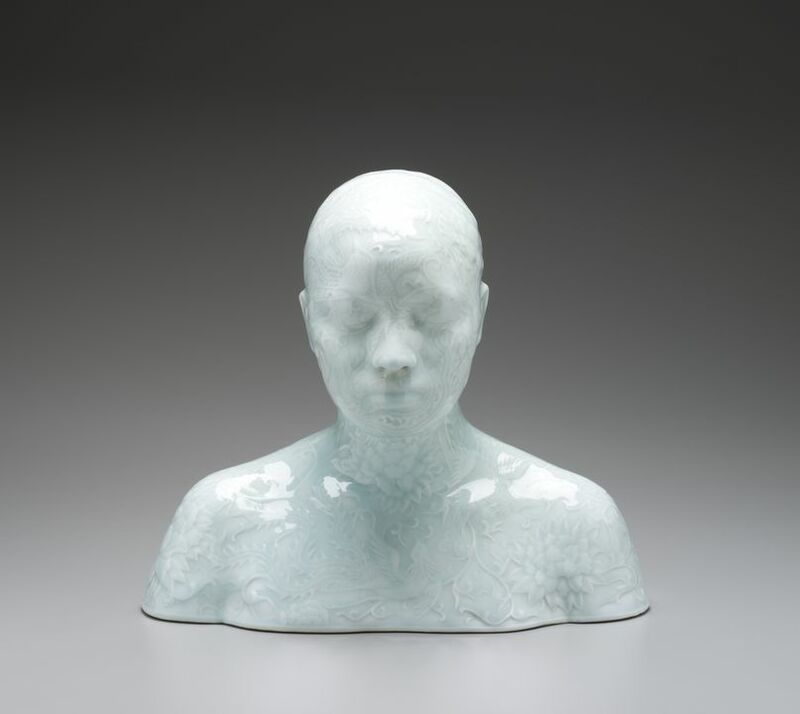 Ah Xian made his first porcelain body-casts in 1998 at Sydney College of the Arts. He decorated these earlier pieces himself by painting directly onto the porcelain. Chinese artist, Ah Xian, migrated to Australia in 1990, following the Tiananmen Square massacre in 1989 and a year as a visiting artist at the Tasmanian School of Art. Receiving an Australia Council grant in 1999, he collaborated with teachers and artisans at studio-kilns in Jingdezhen, Jiangzi province, and produced the 'China, China' series. This consists of around 40 busts in porcelain as well as more recent examples in lacquer and cloisonné. Titled 'Bust 39', this piece is cast from a local girl whom he met while making the series. In 2003, Ah Xian sold the bust to Sydney gallery owners, Gene and Brian Sherman. They lent it to the Powerhouse Museum in 2005 for inclusion in the permanent gallery, 'Inspired: Design across time'. Gene and Brian Sherman subsequently donated the piece to the Museum under the Cultural Gifts Program . This object is currently on display in Reflections of Asia: Collectors and Collections at the Powerhouse Museum.